This holiday season I challenged myself to have a more thoughtful, eco-conscious holiday. This meant no purchasing new clothing items and getting creative with my existing wardrobe. Here are some refashions you can make with supplies you most likely have like a t-shirt and scrap fabric. 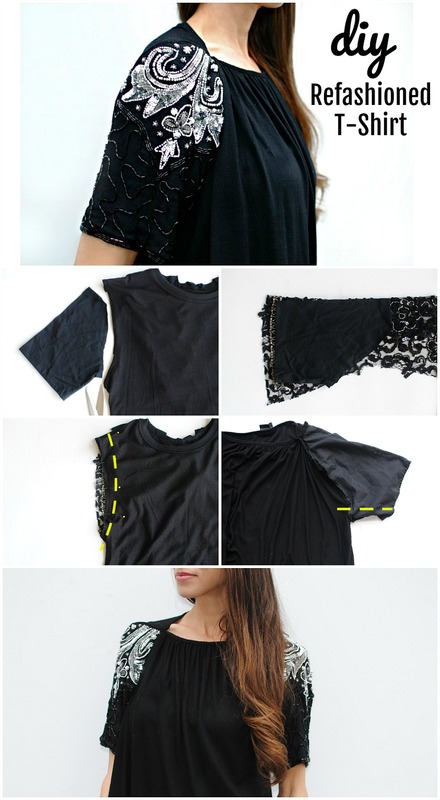 The Lace Sleeve Tee: Refashion a t-shirt by adding lace or embellished sleeves. Remove the sleeves from the t-shirt. Use the sleeve as the pattern. Fold your new fabric in half and place the sleeve along the fold. Cut the pattern out leaving a 1/2" border for seam allowance. Tip: use a fabric that has a scalloped edge or beaded trim so you don't have to finish the hems. Flip the shirt wrong side out and place the sleeve inside the arm hole (right sides together) and pin. I like to pin at the shoulder seam and along the sides. Sew into place. Sew the sleeve seams right sides together. 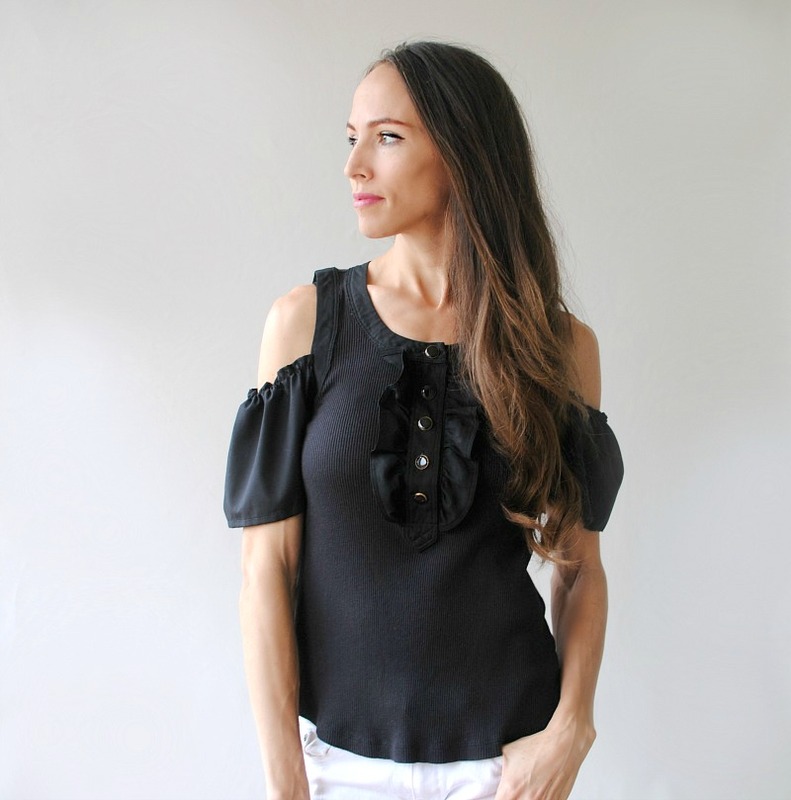 Add a cold shoulder sleeve: Adding a cold shoulder sleeve can transform a basic tank into a cute blouse. Follow the full tutorial here. The Embellished Sweatshirt Update: Take an oversized sweatshirt to fashion-forward look by adding an embellished collar. Measure where you'd like the collar to be. I like to mark it out as well with tailors chalk or a fabric marking tool. I had this cool fringe appliqué in my stash. I pinned it into place and top stitched it. Then I cut away the excess leaving about a 1/4" edge. This was so big on me I did have to take in the sides of the sleeves and bodice. I kept the length because I'd wear it as a sweatshirt dress with tights. What are some other ways you try to keep your holiday season more sustainable? The embellished shirt-sleeves look really good! Such an easy idea with a big wow-effect! So beautiful and dashing dress it is. I am very loved this dress. If you need know more information you can check my divorce lawyer castle rock website. This website are too much good for you. wow, her dress is so pretty, i want one too. Get the essay writing services from the essay typers in UK at the affordable rates at Myassignmenhelp. We have a team of the essay generators who are responsilble for the essay requirments of the students. Students assignment help provides food the best dissertation writers UAE Services on the planet. Our Assignment Writers are Qualified from best colleges. They give the best Assignment Services at the least expensive cost. This is where you might have started your search for assignment help.The previous consumers give their feedback on the website to let the other users know about the quality of their service. For example, if you go to the Allassignmenthelp.com reviews , you can get to know the opinion of different users about their services. You can also check other websites to compare and select the best service for you.